I mentioned here that I’m participating in the Alison Glass Trinket Sew-along and I’m making not one, but two Trinket quilts. 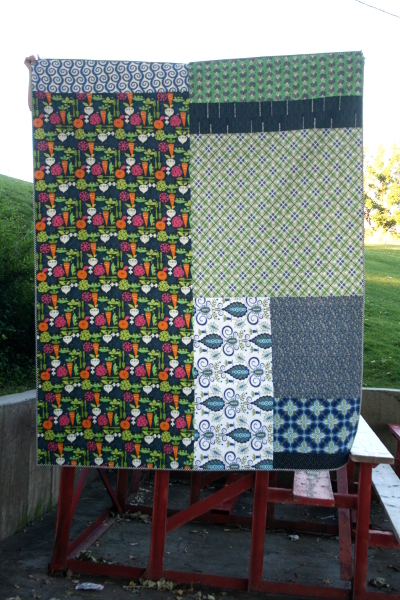 One of them is this enlarged version made using Tula Pink’s Zuma fabric colletion. 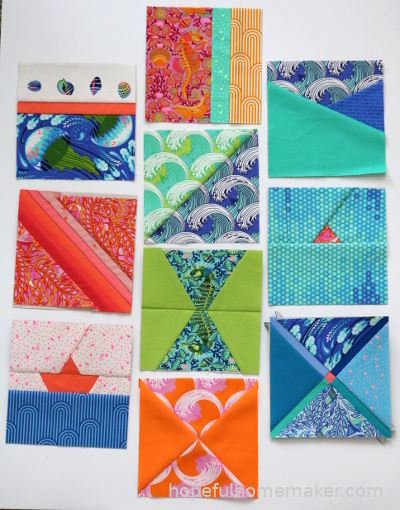 I’m calling it my Trinkets from the Beach quilt and today I’m sharing a Trinket blocks update. 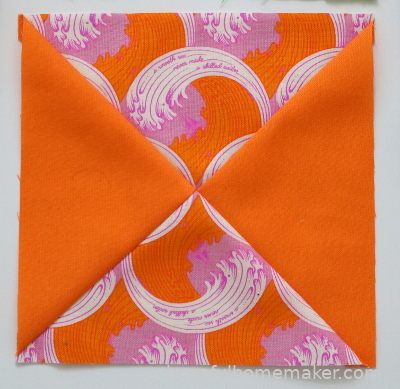 A big goal for me with this project is to improve my skills – and my eye – for fussy cutting. 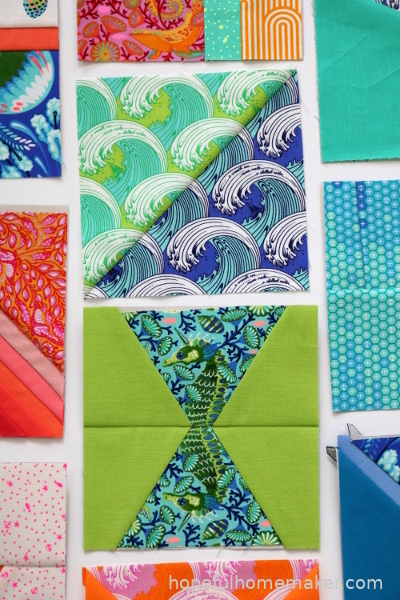 It amazes me to see the work that others do when they fussy cut fabric in ways I hadn’t considered. Then there is the skill of doing it so the seams line up just right. I love it, and it scares me, so it was time to try it. In the two blocks above, I was working on it. The pattern matching with the waves isn’t perfect because I’m working with a layer cake and didn’t have a perfect repeat of the fabric, but it’s close enough for your eye to understand what I was doing. Cutting the seahorses so they would mirror each other was another fun experiment. 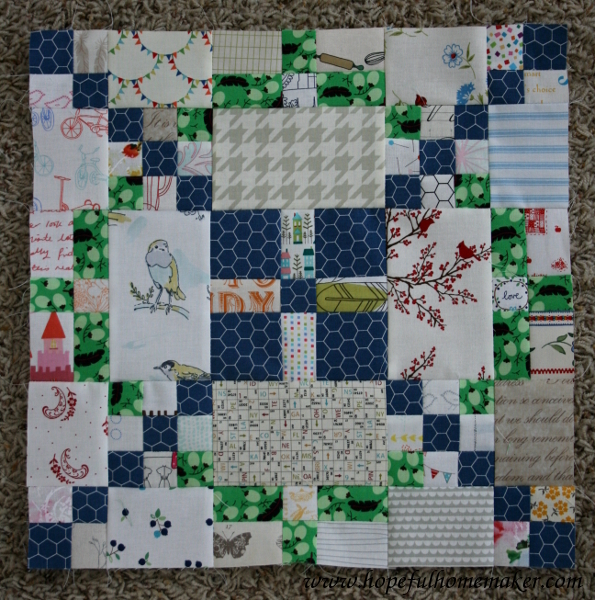 I fussy cut the tiny stingray in the block above because it captures a memory. When I look at it I see the tiny stingrays (about the size of a nickel or a quarter) that we found one summer all over the beach. I see them resting in my daughter’s six year old hand, and it excites me to know I have that memory sewn into a quilt block. Every block I’m making represents a memory or a feeling or something I love about the beach. The orange block above reminds me of what it feels like to get hit hard by a wave you didn’t see coming – or at least one that was a lot more powerful than you expected. Sometimes it was a little scary, but I learned. My children have learned these things as well. They have learned respect for the ocean, and also that they’re stronger than they sometimes think they are. 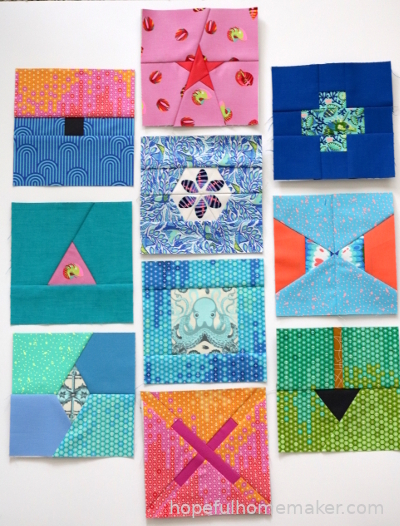 The two blocks below are favorites from the second two weeks of the Trinket sew-along. The top one was another attempt at fussy cutting a shell to use in the hexagon. 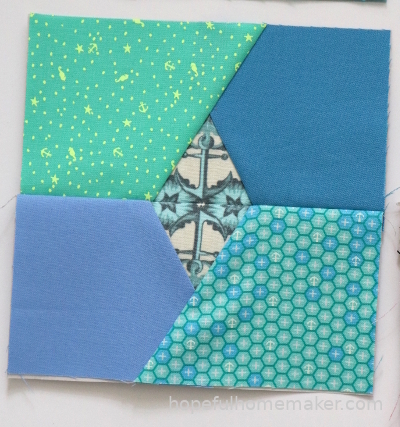 I learned more from that block than I have from any other so far about fussy cutting and foundation paper piecing. I also made it to resemble a sand dollar (although a pentagon would be more accurate). The block below it is one of my favorite memories ever from our early morning discovery walks along the beach. My daughter Marian discovered a tiny, perfectly formed, magical octopus. Sadly, it was dead, but it was perfect in every other way, it’s body less than two inches long. We were speechless as we marveled at it. 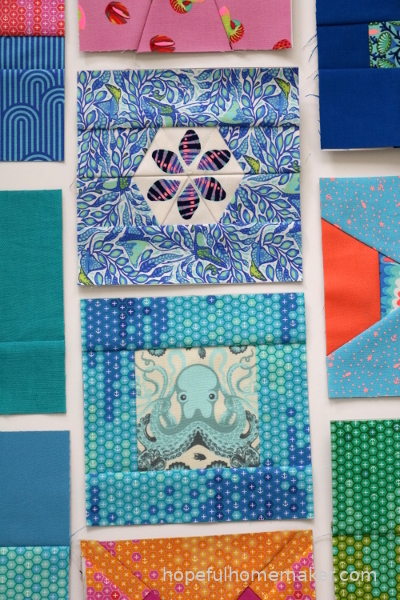 That octopus block has been in my head since before I started this quilt. I think it’s my favorite. 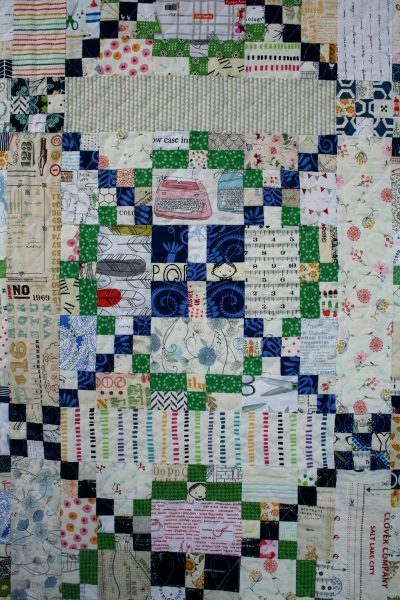 I have become increasingly preoccupied with learning, or at least trying, to tell stories with my quilting. 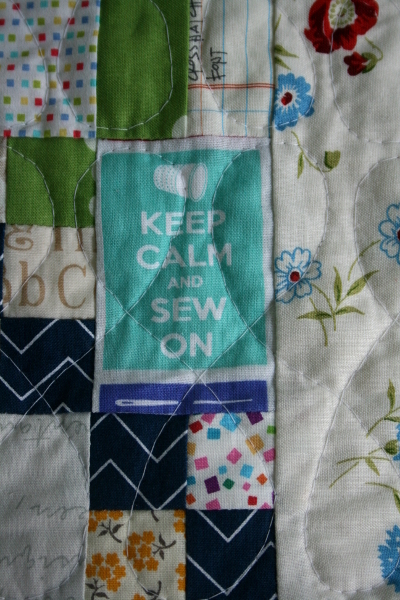 Much of life is stitched into my quilts – something I believe happens to all of us. I can look at certain quilts I’ve made and I’m transported to the things I was experiencing or wrestling with at that time. 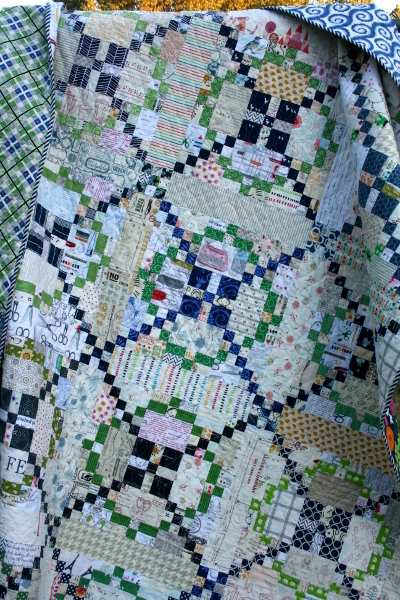 Lately I want my stories to stay with the quilts somehow. I don’t want the quilt to live it’s life as a quilt independent of the story it has inside me. 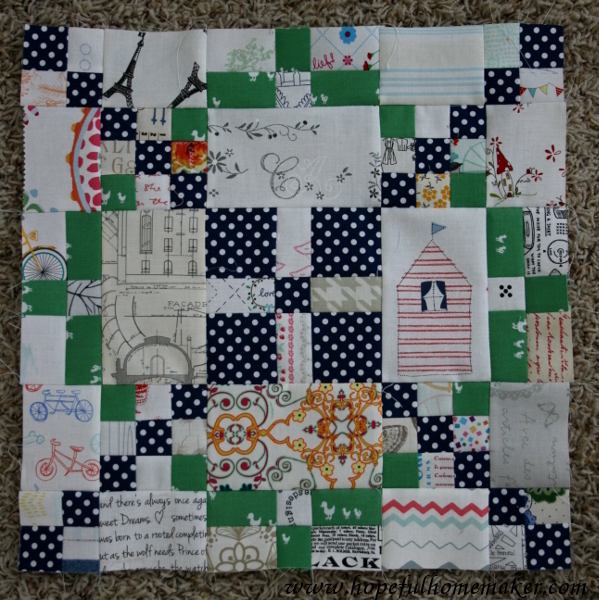 These Trinket quilts are my first experience with making each block to represent a specific story/memory/feeling. 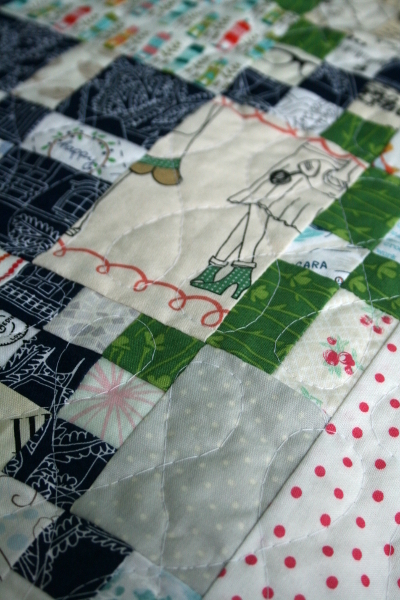 The thoughtfulness while sewing is not new to me, but trying to translate the thoughts into quilt blocks is. If you follow me on Instagram (@hopefulhomemaker) you can read each memory as I share my blocks. Sewing anchors me in good ways. 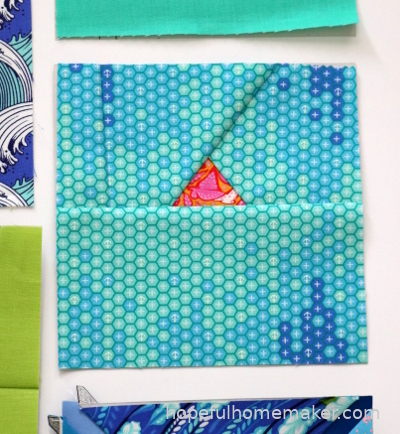 This is a fun quilt to be making! 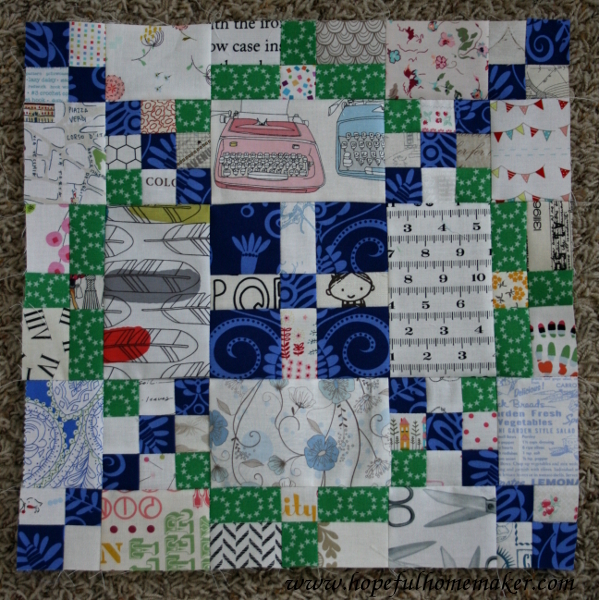 Question for you, though… How would you keep the story with the quilt? Have you ever done this? My Tone it Down quilt blocks have become finished quilt #3 for the year and given how busy life has been, it seems amazing that I’ve finished anything at all. The navy and green together remind me of an outfit my mom bought me in high school. I was running for class president and we found the perfect thing for me to wear when I gave my speech. I’ve always loved navy and green together but when I see this combination the first thing that comes to mind are those clothes. I’m so glad navy is back in style. I never stopped liking it. The backing was pieced in an attempt to “use it up” without worry of running out (something I’ve always struggled with). The Pillow & Maxfield prints were a gift from my sister, the veggies print by Maude Asbury reminds me of Broadbent’s quilt shop where the Utah County Modern Quilt Group meets. There’s a piece in there that I’ve had for at least 15 years because I loved it and couldn’t even explain why. I have very little of Denyse Schmidt’s Katie Jump Rope but used it anyway. 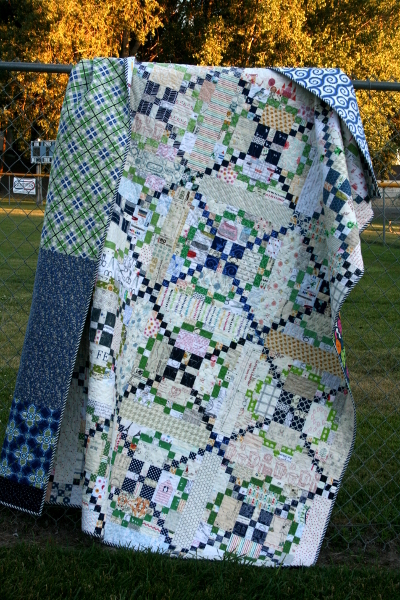 There is a funny story about one of the blocks in this quilt. When I was half done I suddenly felt that I couldn’t bear to make another block. I wanted to do something else, but this project had taken over my space and I’d committed myself to finish it. I started working faster, trying to crank them out, but 97 pieces only go so fast, even when you’re chain piecing. If you look carefully at the top right corner of the quilt, you’ll see in there a bright aqua fabric that’s not very “low volume.” That was the block on the sewing table when my desire completely fled, so I fussy cut a little “keep calm and sew on” piece to swap into the block in place of what I had planned. It would be the reminder block – the one that would make me smile when I remembered how badly I wanted to put it away. In fact, when I had the quilt top finished the first thing my children wanted to do was find that square. What really makes me laugh about that block is the fact that on the top row of the block, the green pieces are upside down! In my lack of enthusiasm I completely failed to notice that I pieced it incorrectly. 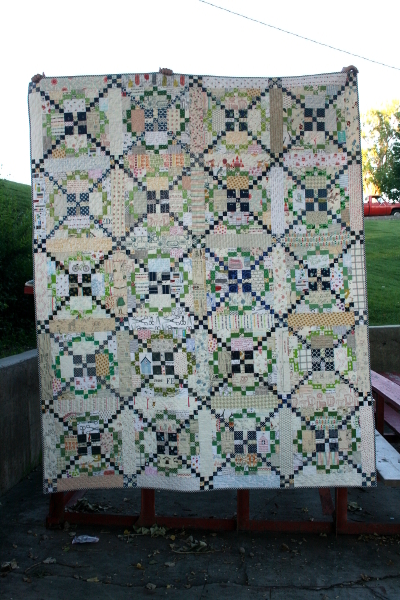 In fact, I didn’t notice it until the quilt was bound and finished and one day I looked at it and it was the ONLY thing I saw. I guess that’s what happens when you look at something too much. So there’s an imperfect block in there that will stay as it is, and the whole thing just makes me laugh. 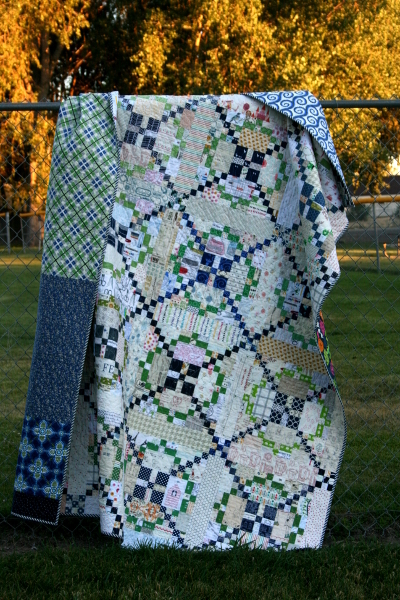 I guess a mistake like that is a great way to make sure your quilt is one of a kind! The rows vary in height (I did that on purpose) and it’s full of mistakes but I suppose that means it has even more of me in it. 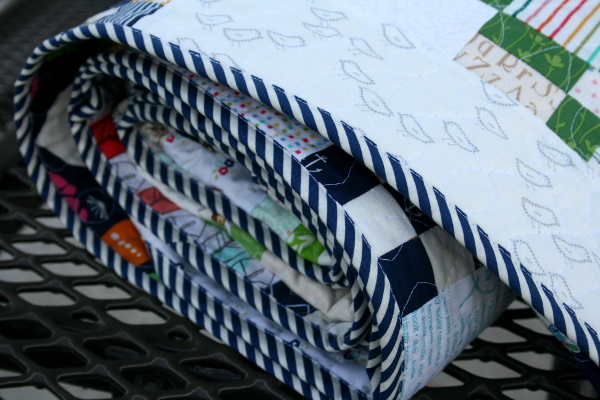 For the binding I hunted down the diagonal navy stripe from Bonnie & Camille’s April Showers collection and it was the perfect thing. A finished quilt is better than a perfect quilt, and this beauty will always be a reminder to me of where I am right now – my skills, my tastes, the craziness of life, my sudden desire to quit, the popularity of low volume fabrics (a trend I’ve totally fallen for) and even a reminder of other quilters, well-known or not, whose work influence me at this point. The evening walk we took as a family to take these photos and the afternoon my kids spent crawling all over it playing “I spy” are memories already wrapped up in it, too. Thanks so much for visiting! For more information on the source of this pattern see this post. Like many others, I fell in love with Lissa Alexander’s Tone it Down quilt which was featured in the January/February issue of American Patchwork & Quilting. I loved the instructions for strip piecing, but loved the scrappy low volume look more and wondered if I’d be up for so many hundreds of little pieces (approximately 2250!). 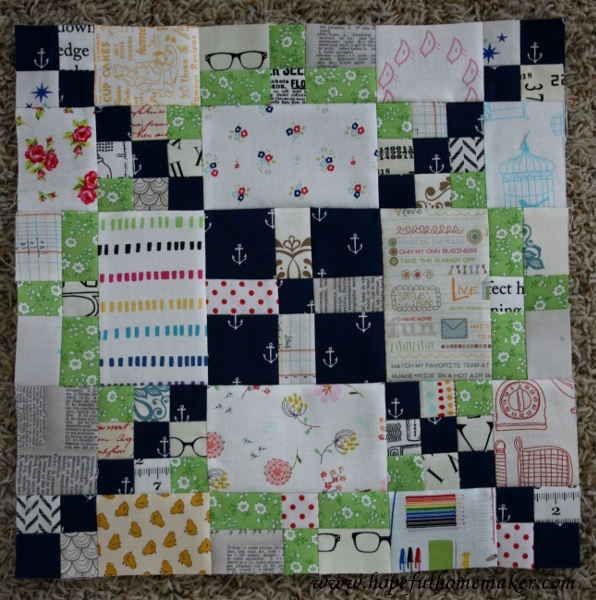 Early in the year I decided to make a test block, choosing navy blue and green as my two colors, and I loved it. Still, it sat, in spite of the quilt along. Last week I made a huge mess in my sewing room, pulling out most of my low volume prints and cutting into them until all the background pieces were cut. I’ve made one block every day or two since, and with every block I make I like this quilt more. It makes me happy to be using so many different fabrics that I love, and doing a bit of fussy cutting in a few spots has been a lot of fun. The block above is the brightest so far, and I really love that little boy in the center, and also the pink typewriter. I pieced it on my youngest son’s birthday, and it reminds me of his happy smile. I’ve been starching all the pieces before I sew, which takes time, but I’ve been able to piece the blocks together without any pins. While not perfect in every spot, I’m happy with the accuracy of my seams. 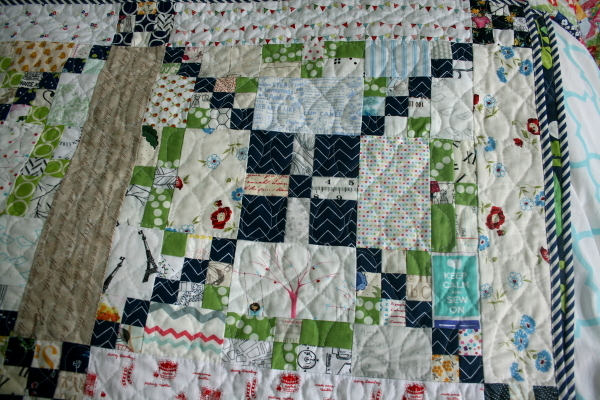 I love the way they look together, although there will be sashing and lots of little nine patches between them when the quilt top comes together. 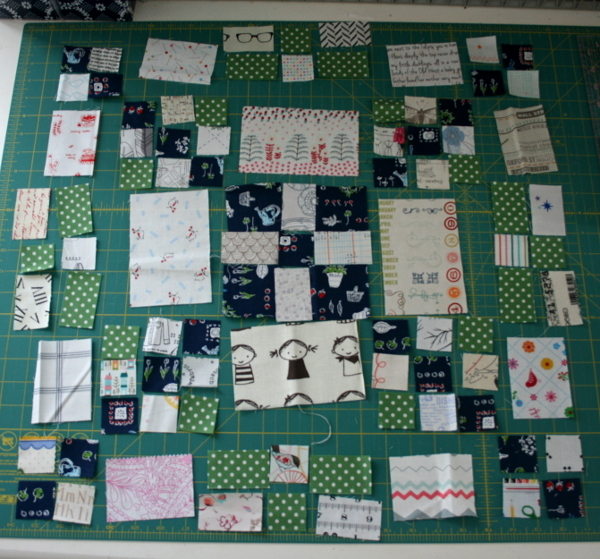 After finishing a block I’ve been laying out the next one so it’s ready for me whenever I have a few minutes to sew. So far I’ve been lucky and no little hands have scattered the pieces. 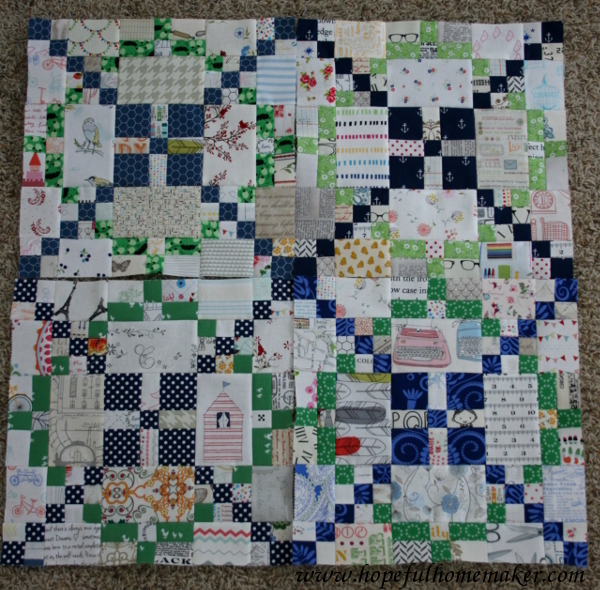 After the first four blocks I feel like I have a system for chain piecing and I’m getting faster. What sounded overwhelming at first has become enjoyable in these bite sized pieces and I’m sure I’ll have all twenty blocks done soon. 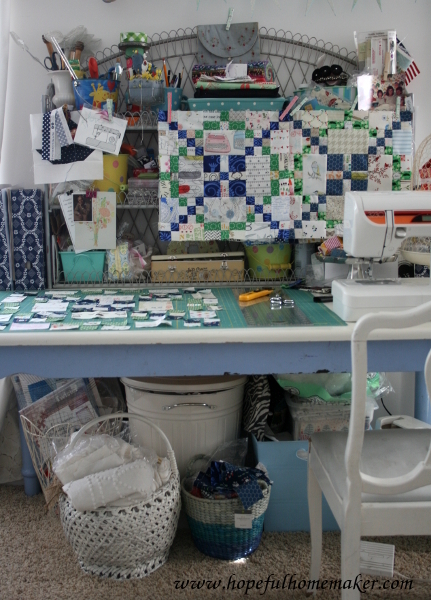 Maybe it’s just because I haven’t had much time to sew this year, but the sight of my sewing space is really making me happy this week! It feels so good to do even a little bit of sewing. Linking to Freshly PiecedAlso, I almost forgot! My sister is giving away a free Craftsy class over at Sisterview. You should enter!